Now it’s finally time for the next KaffeBox, for some reason it hasn’t taken a long time at all receiving this package of coffees, so let’s go with the November month now when the September review is done. We have to catch up!! 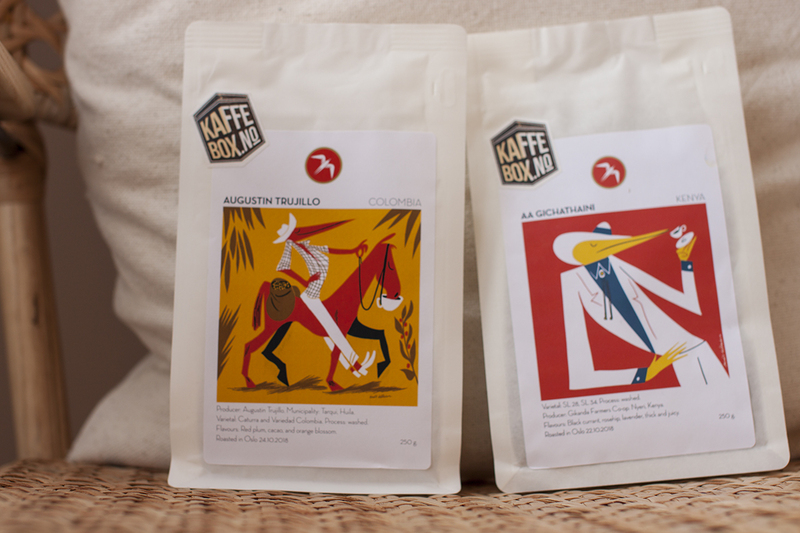 This will be the 12th time for KaffeBox, you can read the most previous post here. This month we will go back in time because Postnord kept the coffee for a month and I got it later. The coffee comes from the Norwegian Oslo roastery Fuglen Coffee Roasters. This week we will review one coffee from Colombia and Kenya. Red plum, cacao & orange blossom. Expectation: I actually think that this coffee will be spot on, I mean; the notes are perfect for me. Sometimes I just want a really typical Colombian and I really do hope that this one delivers exactly that. Blackcurrant, rosehip, lavender, thick and juicy. Expectation: The pure smell of this coffee was amazing, I’m getting some flashbacks from great coffee from Kenya. Yet again I think that Fuglen Coffee Roasters made some great decisions with this coffee as well! Conclusion: I’ve never tried Fuglen Coffee Roasters before, it might have something to do with 2018 being their first year. At first sight, the bags art is really in my alley, it’s edgy, cool and has one of my favorite combinations of colors. Love it! If we battle these two coffees against each other I have to say that this might be the hardest pick for me yet; I love Colombian and I love Kenyan… And these sound like coffees I would buy in a second… So, I guess we’ll have to see haha! Previous post The Coffeevine November 18 Box – Morgon Coffee Roasters Again!